Crepuscular rays /krɪˈpʌskjʊlər/ (more commonly known as sunbeams, sun rays, splintered light, or god rays), in meteorological optics, are rays of sunlight that appear to radiate from the point in the sky where the Sun is located. Shining through openings in clouds (particularly stratocumulus) or between other objects such as mountains, these columns of sunlit scattering particles are separated by darker shadowed volumes. Despite seeming to converge toward the light source, the rays are essentially parallel shafts of sunlit and shadowed particles. Their apparent convergence is a visual illusion from linear perspective. This illusion is the same as railway lines' or long hallways' appearing to converge at a distant vanishing point. The scattering particles that make crepuscular rays visible can be air molecules or particulates. The rays in some cases may extend across the sky and appear to converge at the antisolar point, the point on the sky sphere directly opposite the sun. In this case they are called anticrepuscular or antisolar rays. These are not as easily spotted as crepuscular rays. This apparent dual convergence (to both the solar and antisolar points) is a perspective effect analogous to railway tracks appearing to converge to opposite points in opposite directions. Crepuscular rays usually appear orange because the path through the atmosphere at sunrise and sunset passes through up to 40 times as much air as rays from a high midday sun. Particles in the air scatter short wavelength light (blue and green) through Rayleigh scattering much more strongly than longer wavelength yellow and red light. 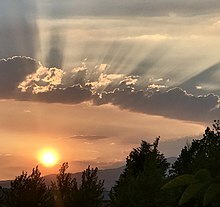 ^ "Crepuscular Rays". Weather World 2010. University of Illinois, Champaign-Urbana. ^ Schaefer, Vincent J.; Day, John A.; Pasachoff, Jay (1998). A Field Guide to the Atmosphere. Houghton Mifflin Harcourt. p. 169. ^ "Crepuscular Rays, India". Earth Observatory. NASA. Retrieved 2018-05-07. ^ a b c d e f Lynch, D. K., & Livingston, W. (1995). Color and light in nature. Cambridge: Cambridge University Press. ^ Edens, Harald. "Crepuscular rays". Weather Photography lightning, clouds, atmospheric optics & astronomy. Retrieved November 1, 2011. ^ Cowley, Les. "Anti-solar (anti-crepuscular) rays". Atmospheric Optics. Retrieved March 19, 2015. ^ Day, John A. (2005). The Book of Clouds. Sterling. pp. 124–127. ISBN 978-1-4027-2813-6. Retrieved 2010-10-09. ^ a b "Light Shafts". Unreal Engine 4 Documentation. Archived from the original on 2018-11-17. Retrieved 2018-11-17. ^ E.g. this term is mentioned in: Krüger, Jens; Bürger, Kai; Westermann, Rüdiger (2006). "Interactive screen-space accurate photon tracing on GPUs" (PDF). Proceedings of the 17th Eurographics conference on Rendering Techniques (EGSR'06). Wikimedia Commons has media related to Crepuscular rays. This page was last edited on 28 January 2019, at 04:25 (UTC).